A point and click adventure game where it is possible to spend more time just reading signs and listening to townsfolk then actually playing, which can be a lot more fun than battling the game's interface. All items in the game can be examined; then, once examined, are usually quite hilarious and a pleasure to read. The user interface is sometimes more difficult then the actual monsters, which are near impossible already. Overall the game was quite solid. The interactions of characters and objects were significantly stronger than I would have expected, but the user interface often times made it very difficult to immerse myself into my character. The story line is simplistic, but made up for by the interactions between all of the characters and the environment. There were countless times that I found myself laughing at many of the witty jokes and remarks. 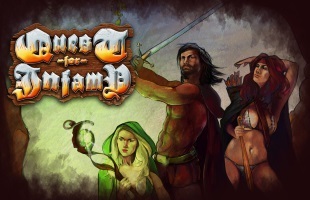 For anyone that enjoys point and click adventures, or if you are willing to try out the genre with a bit of patience, Quest for Infamy is a good pick up. The story starts off in a small town by the name of Volksville. You have arrived on just the right day because an execution is about to begin. The main character is a middle-aged man by the name of Roehm, who appears to be a wandering traveler and Sean Connery doppelganger. The first storyline that you must walk is about the execution that will be happening later in the day. Your goal is to travel from shop to shop, speak with each person and learn more about the execution. However, no one really talks about the execution. Instead of learning about your goal, you learn more about the people of the town. This is not necessarily a bad thing, just not the goal I thought I was attempting to achieve. After speaking with everyone and learning about some of the very interesting characters, you stroll over to the execution. You witness a classic "I stole to feed my starving family" execution, which only adds a new depth of character to the mayor and townsfolk as a whole. Overall, the storyline added little complexity to the game, but added a lot of character qualities. As I continued on my adventure I was able to leave the city of Volksville and finally get into a dark and scary forest. The townspeople must always be terrified since this forest is literally right outside of their little wooden fence. However, upon entering the forest I encountered a skeleton that apparently did not like me very much because it started to attack. I was brought to a separate combat screen that had four buttons on it and a small tutorial popped up. After reading through the tutorial, I figured it was simple enough, so I began my attack. I have never been so wrong in my life. I would use the stab attack: it was a miss. Discouraged, I would use the hack attack: again a miss. Wondering if I would ever make contact with the skeleton, I used the stab attack again, but this time I made contact. This is the first monster I have faced, so surely it should be near dead from just one hit, right? I look up to the health bars to see that I have managed to deal two points of damage on his forty-five point total. During this time of me apparently swinging like a mad man, the skeleton managed to take forty out of my forty-five health points. The next turn rolls around and I managed to die, not really understanding what had happened. A few fights later I was finally able to make contact with the monsters, but the combat system still seemed very luck based. Every game needs a way to bring the player's actions into the game itself. The user interface for Quest for Infamy feels like a never-ending boss battle which is impossible to win. The main screen has three buttons on it, all of which are difficult to understand what they do. It doesn't help that the load game button is also the options menu, so that loading a game appears to be the second function of the "restore infamy" menu. The in-game interface does not get much better, with the disappearing menu bar and strange icons. The merchant menu, where you buy and sell goods, is still a mystery to me. I have attempted to figure out the menu over and over, each time to accidentally buy something that I have no idea what it does because it has no description at all. The icons for buying items are a bag and a hand, with no description of what they do, which leaves guessing as the only option. The game's true beauty lies in its rich environment, in which everything seems to play a part of your adventure. I am one who wants to click on everything and oh boy could I. There are four main interactions that you can have with an object: examine, use, talk and attack. When encountering something such as a wooden door, most would think that knocking would be the best course of action. In my adventures I was not a man who performed the usual, so instead of attempting to knock, I tried to attack the door with a heavy emphasis on tried. I was immediately told that I was a "dumbass" for trying to fight a door. Still upset that I could not fight the wooden door, I attempted to fight a Gargoyle statue. However, this time I was not called names but instead I was told that fighting a Gargoyle was a terrible idea. I must have hit a nerve because the Gargoyle shot laser beams from its eyes and killed me instantly, forcing me to load my last save. My second time around I planned on taking things a little slower; maybe talk to some people instead of always letting my sword lead the way. I quickly discovered that talking to people had a higher result of finding information and a lower chance of getting laser beamed. I managed to travel around the entire town, talking to every individual from the giddy brew-master tending to his garden to the mysterious magic shop owner. Most characters were quite excited to share all they knew about their town, but the magic shop owner, "Mr. Magic," enjoyed telling me how much smarter he was than me. I mean, I guess I did try to fight his stone Gargoyle after all, so I guess it was fair. The main focus for Quest for Infamy is not to look pretty but to excite its players through its fun and engaging environment. The visuals of the game are sometimes difficult to recognize, especially friend from foe; occasionally it actually enhances the point and click by having to examine things in order to get its story. The character interactions are the only thing that really stood out to me, and that is probably because they are so vastly different from the game itself. The interactions between characters go into some strange realistic 3D head display. This is not necessarily a bad thing; it is just strange the first few times that you see it and takes some getting used to. The soundtrack of the game is quite bland, often times just playing cricket noises to simulate nighttime. There does not appear to be any unique music to the game, which is slightly disappointing since this is a genre of game that can really thrive on good music; good music and a nice scotch, but I digress.